One of the most common arguments used by believers for the existence of God is the "argument from design". Perhaps you've heard it as "Just look at the trees", or "How could all of this just happen by chance?". These are essentially just ways of saying that because nature is complex, therefore it must have been designed by some intelligent being. The core assertion is that "complexity necessarily implies design, and design requires an intelligent designer", or simply just "complexity requires an intelligent designer". Lately I've noticed that another assertion has been added to the mix, namely "information requires an intelligent designer". This is very similar to the argument from complexity, and on closer inspection it seems that the logic underlying it is indeed the same, and therefore so are its flaws. Premise 1: Complexity requires an intelligent designer. Premise 2: Nature is complex. Conclusion: Therefore nature requires an intelligent designer. That is logically valid, but I would argue that it is not sound. That is, I would strongly dispute premise 1. Let's explore this in more detail. The logical process people usually take when following the argument from design is to first look at what humans are capable of, then notice some particular aspect of nature that they think looks similar, and then infer that nature must have been the product of some intelligent designer, just as the things we create are products of human design. But humans don't only design complex things. Humans can also design very simple things, including concepts far less complex than anything we see in nature. I think the reasons people don't use "the argument from simplicity" are (a) not much in nature can be described as "simple", and (b) it seems less intuitive to argue that simplicity cannot arise by chance. The combination of these two reasons may well be paradoxical. In order to defend the first premise, believers will give examples of complexity in things that humans have designed, since intelligence is often defined with reference to humans. However, there is also obvious complexity in things that humans have not designed, which should call into question the idea that complexity requires intelligence. However, since everything that exists in the universe technically falls under the definition of "nature" (from premise 2), and the conclusion is that nature was intelligently designed, it becomes impossible to offer a counter-example to premise 1 without begging the question. Premise 1 therefore assumes the conclusion, and as such the argument becomes circular. We've already seen that humans can produce designs that are not complex, but what about complexity that was not designed? One definition of the complexity of a system relates to the amount of information required to describe it. A common example used is a cup of coffee with a layer of cream on top. In its initial state, it is highly ordered (low entropy), and can be described with very little information. As the entropy increases, the coffee and cream will begin to mix, which results in an increase in the complexity. However, the maximum entropy state is where the coffee and cream are mixed so well that they are in equilibrium, and once again the complexity is low. 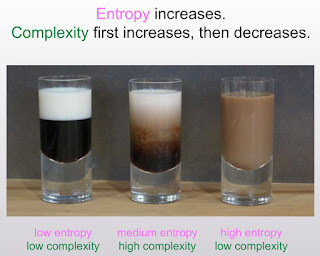 So using this example we can see that even though entropy will increase continually, complexity will at first increase but then later it will reach a peak and then decrease. The same will apply to any closed system, including the universe. 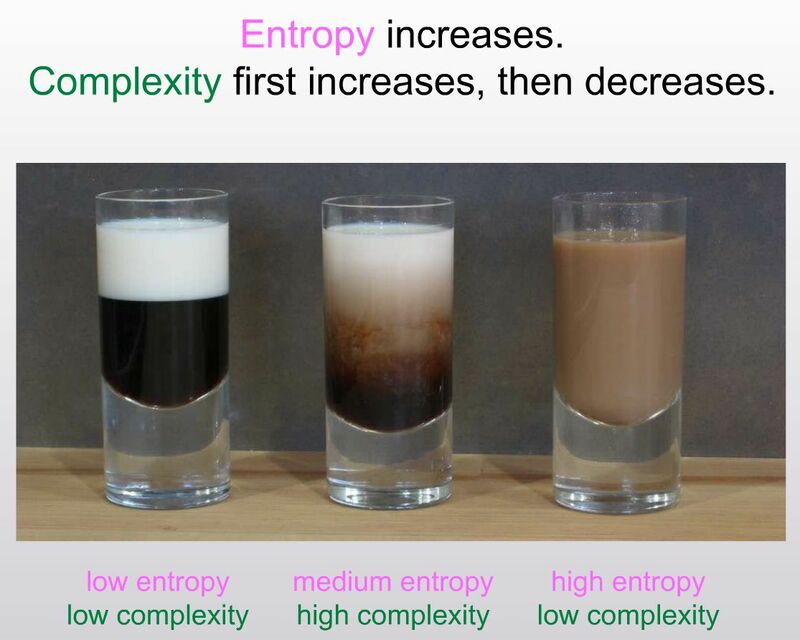 In this example, we saw complexity increase naturally due to entropy, but none of this was designed. It was purely a result of natural processes. In this contrived example you could argue that the initial conditions were designed, but that's a separate issue and one I will discuss in the next section. For now, all I want to show is that complexity can increase due to the interactions of particles following natural laws/processes. If you did want to view the initial conditions as "design", then the example actually shows complexity increasing as the design erodes and the system becomes more disordered. Complexity on its own is not sufficient to infer design. In case you were wondering, most hypotheses about the future of the universe suggest that it is nowhere near half-way to equilibrium, which means we should expect it to continue to become far more complex well into the future. We are still very close to the steepest uphill climb on the complexity curve. When we observe nature more closely we do find examples of complexity and even order arising through natural processes. Snowflakes and crystals are highly ordered, and we know they form naturally. Digging deeper, there are experiments that show that complex molecules such as RNA can self-assemble given the right conditions, which demonstrates that complexity can arise naturally. All that is necessary are the laws of physics and the right mix of different molecules, and complex chemistry will emerge all on its own. We can witness the same in biology as well. The baby that forms in the womb is far more complex than the egg and sperm that produced it. Even though there is still much we don't yet know, we have a reasonable expectation that natural processes can account for all of it, and that there is no 'baby-designer' at work in every case. Natural processes, some of which may be random, determine which features we inherit from either parent. You may argue that an intelligent designer was required in order to configure the natural laws in such a way as to make this possible, and that may or may not be true. We simply don't know where the laws of nature came from, or why they have the properties they do. Any belief about their origins remains in the realm of pure speculation at this point, at least until some origin can be demonstrated (if that is even possible). One of my goals in this article is to push the design argument back to the origins of the laws of nature, which then makes it invalid when discussing the behaviour that can arise as a result of those laws of nature. This is not to say that nature in all its detail could not have been designed. It is impossible to know that either way. Intelligent Design is not falsifiable. The argument I am making is that given the laws of nature, complexity can emerge naturally without requiring an intelligent designer. That can be demonstrated, as in the examples I provided above. Given that an intelligent designer is demonstrably not required in order to produce complexity, Occam's Razor suggests we should discard that hypothesis. It also means premise 1 in the above argument is false, and the conclusion is therefore unsound. Further, the origins of the laws of nature are unknown, and perhaps even unknowable. It has not been demonstrated that these laws require an intelligent designer, nor even that an intelligent designer could produce such laws. For what it's worth, some versions of the Fine-Tuning argument assume that even God could not change these laws, and was constrained by them (else why was fine-tuning necessary?). Any belief about the origins of the laws of nature then becomes a matter of speculation and blind faith. Given our extreme ignorance on this subject, it seems that the probability of anyone coming up with the right answer by guesswork is extremely low, and may as well be zero. The time to believe in any hypothesis is after it has been demonstrated, not before. A more rational approach (I submit to you) is to remain agnostic and open to further discovery in the future, should such a thing even be possible. Accepting uncertainty and a limited (if inherently flawed) understanding of reality is about the best we can do, I think. Holding dogmatic beliefs for things that cannot be tested is just a recipe for self-deception and delusion, which can be harmful to ourselves and others. A more recent claim made by believers seems to be that information requires an intelligent agent. Once again the argument is quite similar to the argument from complexity above. And once again I disagree with premise 1. As with the earlier argument, it ignores examples where intelligence can produce systems containing very little information, or even no information at all. It begs the question in the same way (premise 1 assumes the conclusion in order to avoid the counter-argument that premise 2 is actually evidence against premise 1). And of course, it is demonstrably true that information can arise naturally. According to the video, a message containing completely redundant information (for example, a string of zeros) technically contains no information. Yet it is highly ordered, and we may well design such patterns into things we create. Conversely, the video defines a string of random numbers as containing maximum information. Yet randomness is almost the opposite of design. We can use randomness in order to generate features of a more complex design (using a genetic algorithm for example), or we could attempt to severely limit randomness (and thus information) in order to maximise order. Thus, information and design are not strictly correlated. Given the definition of information as essentially just "entropy" (there are other definitions of information, which I will not cover here), it necessarily follows that information naturally increases in a universe where entropy increases. The second law of thermodynamics states that the total entropy of a closed system must always increase until equilibrium is reached (the state of maximum entropy). As for why this happens, the video makes the compelling suggestion that it is the uncertainty (i.e. randomness) of quantum mechanics that continuously increases the amount of information (entropy) in the universe. From the time when Isaac Newton discovered the classical laws of motion, people began to see the universe as being completely deterministic. A famous example is known as Laplace's Demon, named after Pierre-Simon Laplace. He hypothesised that if someone (the demon) knew the exact location and momentum of every atom in the universe, they would be able to determine every event in both the future and the past. In such a universe, the amount of information would be completely static. Knowing the total information at any moment would be sufficient to derive the information from any other moment. An amusing consequence of this would be that humans could not actually produce any information, since all of the information about every action anyone ever took is already contained in every other moment, right back to the beginning of the universe. However, the discovery of quantum mechanics in the early 20th century added a new perspective to this view. Quantum mechanics suggests that it is actually impossible to know both the location and the momentum of any atom, and that at best only one of those properties can be known precisely. This is known as the uncertainty principle. Instead, physicists now talk about the probability that an atom will be at any particular location. Depending on your interpretation of quantum mechanics, this lack of complete certainty brings with it an increase in the amount of information contained in the universe. If it were possible to wind back the universe and hit 'play' again from an earlier time, the accumulation of quantum uncertainties means the future would turn out very different, despite the initial conditions being the same. However, there is at least one interpretation of quantum mechanics, known as the 'Many Worlds' interpretation, where the past and future may still be completely deterministic. In this interpretation, every possible state of the universe actually happens, with the universe branching off into sub-universes at every quantum event. Any human observer would still observe entropy increasing in their local universe though, so we would experience the illusion of creating information despite every outcome actually being pre-determined. By that I mean that for every decision we ever made, our universe actually split into different versions where we actually took every possible path. There would be duplicates of ourselves in those other universes completely unaware of us, and the further you progress though time the more those duplicates' paths would diverge from ours, including branching into yet more duplicates etc. The numbers become dizzying very quickly, but this is an interpretation of quantum mechanics that is taken very seriously and is currently quite popular among physicists. The takeaway here is that information (entropy) not only can arise naturally, but must do so (at least from our perspective). The second law of thermodynamics demands it. While the 'Many Worlds' interpretation of quantum mechanics may suggest that all of the information in the universe was there in the initial conditions (and thus a believer could argue it was put there by an intelligent being), it would imply that the universe is effectively deterministic and we have no free will. Amusingly, in a Christian context, all of us would be both saved and not saved, and everything in-between, and the entire thing would be outside our control. I chose the title of this article specifically to induce cognitive dissonance in the minds of those who believe that complexity and information cannot exist without being intelligently designed. The weather patterns on earth are a result of interactions between highly complex systems, and as such even with our best technology we still cannot always accurately predict exactly when and where a flood will occur, or a hurricane, or earthquake, or any number of other natural disasters. These events often cause huge destruction, including loss of life. In similar fashion, viruses are also extremely complex and contain a lot of information that host cells use to produce more copies of the virus, all of which may cause significant harm or even death to the host organism. If your view of the world includes God intelligently designing butterflies and fluffy kittens, but not viruses and huge, destructive natural events, then perhaps you may want to think it all through a little more. Of course, there are those who insist that this suffering was somehow required in order for us to have free will, or God really has some good reason for it all and this is actually the best of all possible worlds. If you believe that, I want to know if you think you will have free will in your afterlife, and whether that afterlife will also be affected by viruses, floods, and other horrific natural events. As I've demonstrated in this article, both complexity and information can arise naturally, as a result of natural processes. We don't know why those natural processes exist, or why they are the way they are, but we can study them and determine how nature behaves. When we study the natural world and all of its complexity we can start to see patterns emerging that tell a story of its past. For example, the fossil record tells a story of long ages and a gradual increase of complexity in the animal kingdom over millions of years. The Earth's geology also supports that story with its own history of geological events spanning back to the Earth's original formation. We use information in the chemical composition of rocks to determine when they formed, and we can do the same with fossils too. We use information in the DNA of animals and humans to determine our ancestry, and to fill in yet more details about our timeline. Each of these discoveries accumulates to provide an ever clearer picture of the history of our planet. We (most of us) no longer perform rain dances to try to influence the weather, because we have a greater understanding of the hydrologic cycle. We've sent rockets into space, because we understand the Earth is a sphere (actually, it's an oblate spheroid), and is not covered by a solid glass dome. We've sent probes beyond our solar system, because we want to learn more about the universe. We've even recently discovered exoplanets relatively close to Earth that may support life. We developed medicines and other treatments to improve our quality of life and extend our life spans. We invented a way to communicate with other people across the entire planet. Much of our planet was once hostile to life (and much of it still is hostile to human life), and yet life thrives here regardless. The planet wasn't designed for us, but rather life adapted to the planet. We are not the goal of evolution, because it has no such goals. We are here because our ancestors out-competed their rivals. If Neanderthals had defeated us, perhaps they would have concluded that was their destiny as well. But nature is blind. The complexity was not written into it top-down, but rather it emerged from the bottom up. Those organisms whose individual traits were better adapted to their environment, even just a little, survived to pass on their genes. We are the product of the genes that survived that process, and so is every other species alive today, from apes to ants. We are not the final product either. The only final product evolution knows about is the last one to survive before going extinct. There have been at least 5 major extinction events in the past, and over 99% of all species that ever lived are now extinct. It's not a particularly comforting view, but the universe does not care. It has no aim to please us. When disasters strike, there is no angry deity trying to punish us. It's just the Earth's natural processes doing their thing, completely indifferent to the organisms that live here. Those who pray receive exactly the same outcomes as those who don't, except perhaps the placebo effect. If we want to live happier, healthier lives, we have to create them, and that will require a lot of hard work. Instead of spending our lives anxious to please an invisible man in the sky that no one has ever seen, we should turn our attention to each other and make a real difference to the lives of those who need our help. Our situation has improved only when we built the technology and the infrastructure ourselves. People worshipped gods for many thousands of years, but only in the last few hundred years has our health and quality of life significantly improved, and in a time when less of us pray than ever before. Humans are the most intelligent beings we know about, and it is to humanity and our own creativity that we should turn in order to solve our problems and lift the lives of those who currently suffer. That is what has served us in the past, and it's our best hope for the future. Praying for rain works no better than not praying for rain. Our lives are up to us, and always were. Your divine auto-pilot is missing. It's time to take the driver's seat for yourself, and enjoy the ride with the rest of us. Why don't you pray to Thor for rain?